Yet another hot day lay ahead of us. Temperatures will climb into the 90s by this afternoon, pushing heat indices into the mid-90s to around 100 degrees. But we may see some relief later today. 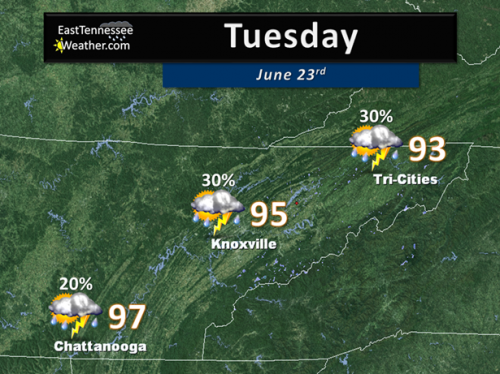 Scattered showers and thunderstorms are possible this afternoon and evening. A few of these storms may be strong to severe. 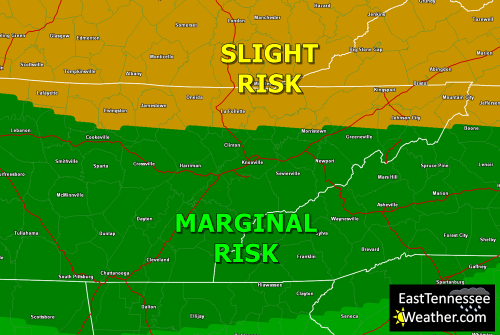 The main threat is damaging winds in excess of 60 mph, but large hail and heavy rainfall may also accompany some storms. 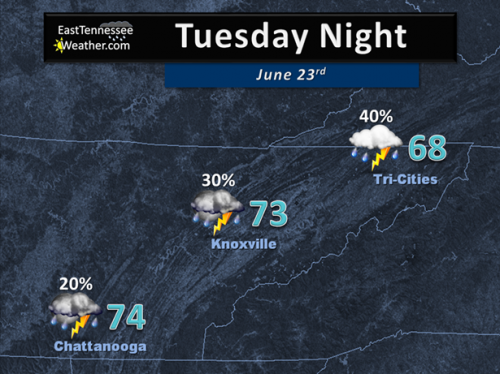 Overall, the severe threat is low but folks living north of I-40 will see the greatest chance of severe weather. The Storm Prediction Center has placed locations along the TN/KY and TN/VA borders under a “Slight Risk” for severe t-storms today. 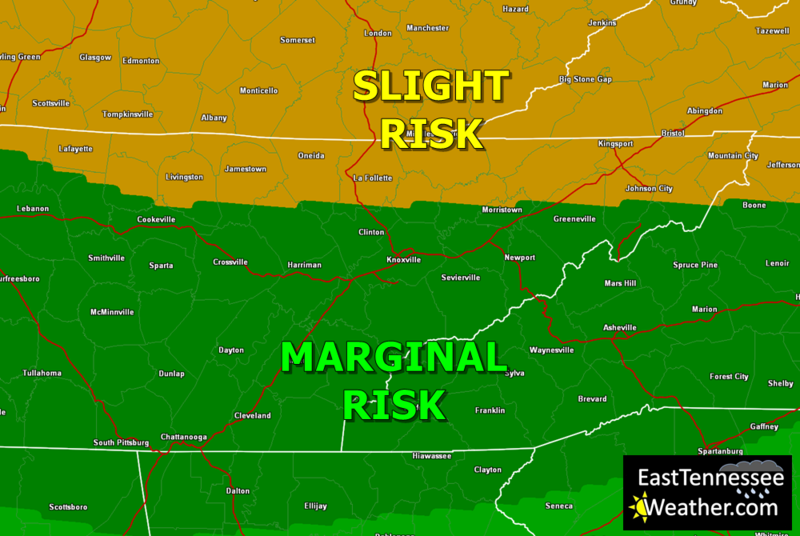 The rest of the region is under a “Marginal Risk”. 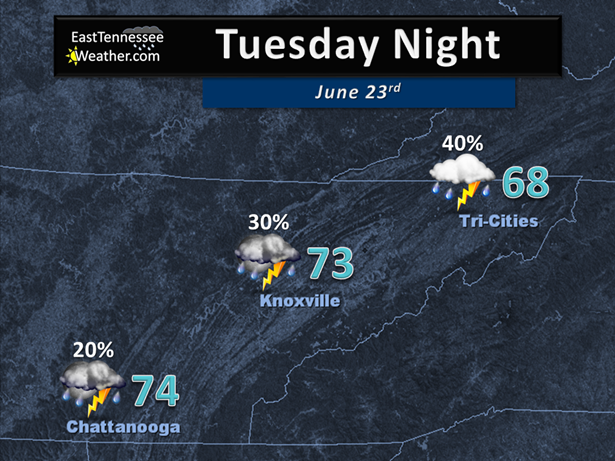 Tonight, scattered storms remain possible. Look for partly cloudy skies with lows in the upper-60s to mid-70s. Temps will be slightly cooler as we head into the second half of this week. 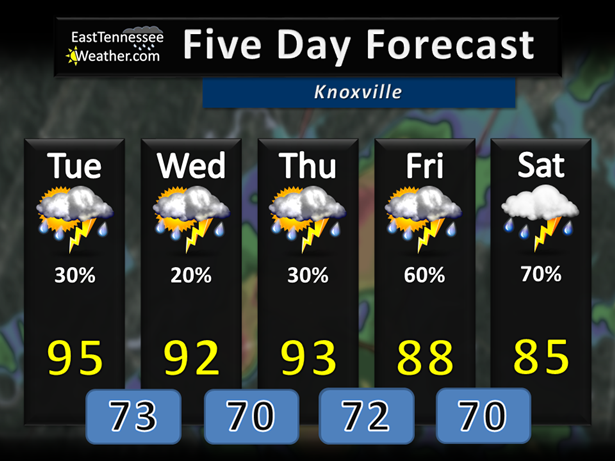 We’ll stick with a slight chance of showers and t-storms for Wednesday and Thursday. Highs will be in the upper-80s to mid-90s. Storm chances increase Friday and Saturday. 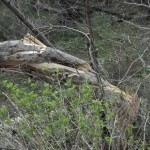 At this time, severe weather does not appear likely. Temps will be more seasonable, with highs mostly in the 80s.